The 4th Annual Coordination Conference of Regional Organizations and International Partners in the Area of Justice, Home Affairs and Security Cooperation discussed key trends and challenges to regional cooperation in organized crime, corruption and terrorism. The event was organized by the Regional Cooperation Council (RCC) Secretariat. In her opening remarks, Deputy RCC Secretary General Jelica Minic said that the region’s strategic goal is to strengthen judicial and prosecutorial cooperation in civil and criminal matters, consolidate existing regional cooperation mechanisms, and enhance mutual legal assistance. The meeting established a working group to monitor closer cooperation of police operations, as well as police and prosecution services in criminal investigations; and a working group to exchange information and share best practices in protection of fundamental rights in justice, home affairs and security fields. Participants shared concrete proposals on how to ensure coordination among national authorities, regional and international organizations, and develop a coherent and integrated reaction. They heard a report on current status of regional cooperation, and reviewed, updated and consolidated regional strategic choices, challenges and priorities. A meeting of the Steering Group on Regional Strategy (SGRS) on Justice and Home Affairs, held ahead of the conference, discussed implementation of the Strategy and approved its Monitoring and Evaluation Mechanism that was prepared by the RCC Secretariat. 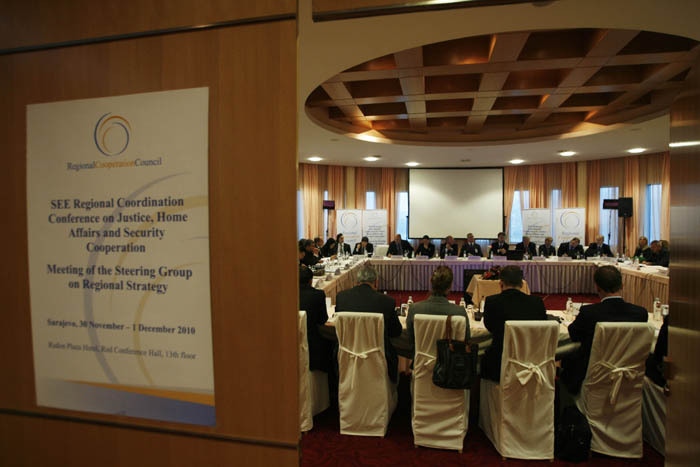 The Monitoring and Evaluation Mechanism is designed to measure progress, impact and results of regional cooperation in justice and home affairs, and it will be functional as of spring 2012. The SGRS meeting is a follow-up to a ministerial conference, held in March 2011 in Budva, Montenegro, which endorsed the SEE Regional Strategic Document and Action Plan on Justice and Home Affairs 2011-2013. The Regional Strategic Document and Action Plan represents the first coherent South East European programme of cooperation in justice, home affairs and security cooperation. It maps priorities and actions in combating key challenges for the region, and integrates efforts to harmonize activities and projects implemented in this area by main regional stakeholders. The Regional Strategic Document and Action Plan on Justice and Home Affairs 2011-2013 is available HERE.